Four little blind puppies are seeking forever homes after farmers in Wales felt the pups weren't cut out to be sheepdogs and dropped them off at a nearby shelter. Volunteers at Freshfields Animal Rescue are hoping to find caring homes for 8-week-old Tomas, Tyler, Smudge and Missy. They're seeking families with older dogs who can act as guides, helping the puppies find their way around their new forever homes. "The puppies are absolutely adorable and are bright and inquisitive," Freshfields volunteer Sarah Morgan told the U.K.'s Daily Post. 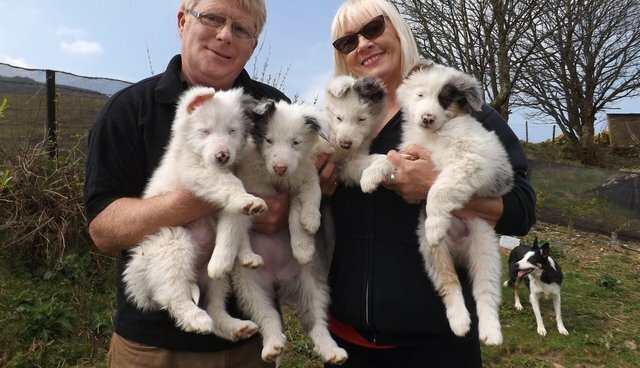 The pups are blind because of a genetic condition that can occur when two Blue Merle collies are bred together, according to the rescue's Facebook page. "The farmer owner is now aware of this problem and has promised not to breed the two dogs together again," the rescue wrote. Like many dogs with special needs, these little pups can live healthy, happy lives with the right forever homes. If you're considering adopting a pet, check Petfinder.com or visit your local Humane Society to meet rescues in your area.